Start 2019 by changing a young person’s life. Become a mentor. The Alberta Mentoring Partnership presents #MentoringMonth in January 2019 to celebrate and raise awareness of mentoring across the province of Alberta. Get involved by becoming a caring mentor to a child in need, learning about mentoring resources and training, and growing mentoring programs across Alberta. Learn what is going on during Mentoring Month. Click here. Show your interest with one of these amazing Mentoring Organizations in Alberta. Click here. Learn more about the importence of mentoring. Click here. These are some of the great resources brought to you by the Alberta Mentoring Partnership. Click here. 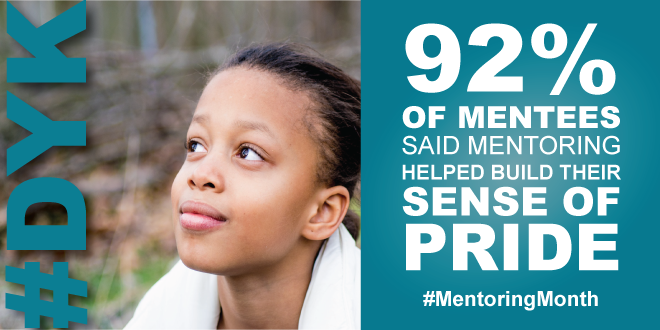 Learn more about the impact of mentoring. Click here. See some of the great individuals throughout Alberta who are champions of mentoring. Click here. It doesn’t take any special skills to be a mentor. If you find yourself reading this, you already have what it takes: an interest in making a difference in the life of a child. Whether you want to volunteer once a week or once a month, there are many mentoring opportunities that fit your schedule. Mentoring in the news, where is your story? Mentoring is a powerful way of lending support to a young person by teaching skills, listening to their perspectives and creating a sense of belonging. Spending time with a young person may seem simple, but science tells us that healthy interactions with supportive adults can boost children’s brain development, mental health, and well-being. Learn more. who, what where, when, why MENTOR? A day of international conversations on social media where photos, video, and powerful mentoring stories messages are shared. To profile AMP tools to inspire diverse types of mentoring. During this week, take the time to #ThankYourMentor and encourage others to do the same. January 31st, 2019: This day concludes the #ThankYourMentor campaign! Anyone with real life mentoring experiences can thank those who helped them on their path to adulthood and beyond. Mentoring organizations are looking for mentors just like you. Individuals Interested in Mentoring - Start Mentoring Today! Get mentoring in your local community today. Fill in the form below and you will send a message right away to the selected local mentoring partner. Please select which region you are interested in finding a mentoring opportunity. I want to learn more about your organization. View all of the #MentoringMonth mentoring partners below. Fill in the Start Mentoring form to show your interest in mentoring with any of these amazing organizations! #DYK – Did you know? 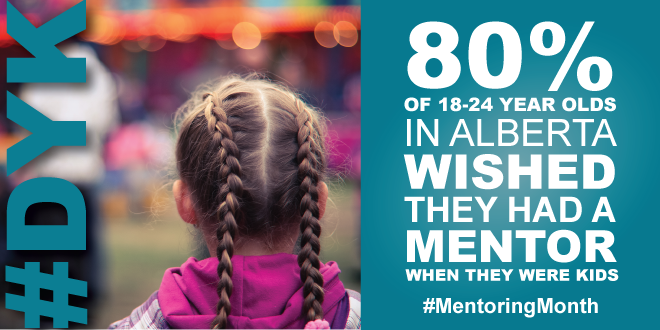 Mentoring is a powerful way of lending support to a young person by teaching skills, listening to their perspectives and creating a sense of belonging. Alberta’s success depends on all of our contributions to the well-being of children. Spending as little as an hour a week with a young person can make a difference to them and to Alberta’s future. What are the Perks of Mentoring? 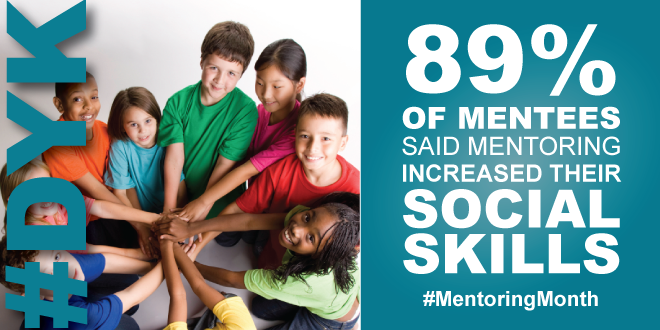 The entire province benefits from mentors’ involvement in the community and with our children. Play an important role in helping tomorrow’s leaders to be better citizens. Make your community a better place. Everyone benefits from a stronger Alberta, and your commitment will be your legacy. Share life lessons and feel good about giving back and making a meaningful difference in the life of a young person. Network with like-minded caring adults. Share experiences, resources, tools and advice with fellow mentors. Add a meaningful experience to your life. Broaden your horizons outside of your work. Enhance your work and personal life with transferable skills like better communication, organization, leadership, and problem solving. The Alberta Mentoring Partnership is your mentoring resource. Check out the #MentoringMonth featured resources that can help you learn more about what mentoring is, the importance of mentoring and how you can access our mentor training. The Alberta Mentoring Partnership is Your Mentoring Resource. Learn more about becoming a partner with the Alberta Mentoring Partnership! Stay connected on all the latest resources with our monthly e-newsletter publication: the MentoringMinute. Follow @AlbertaMentors to share your stories and keep up with the latest news.